This morning’s National Public Radio show included yet another story on “essay mills,” those dastardly buy-an-essay businesses that will write students’ essays for them for a fee. Of course, this is not the first such story on NPR [for example], nor is it anything like breaking news, given how much has been written about these businesses since the middle of the last decade [BBC]. They are simply a ubiquitous presence in higher education and no amount of fulminating is going to make them go away. Given that we aren’t going to convince these businesses to shut down and some number of our students will avail themselves of the opportunity to buy a paper for $50 or $100, what should faculty members do? First, it seems to me, we have to own up to the fact that we are complicit in the entire enterprise. There are ways to assign writing in our courses that are not easily susceptible to this kind of cheating, but those ways are frankly much more difficult (for us) than simply assigning a five page paper on Topic X, due on Date Y. A typical college student in the U.S. is taking 12-15 credits, is working 20-25 hours per week, and likely has child care or other family responsibilities. The typical student is not the over-privileged 19 year-old partying their way through college. But whichever avatar of student you prefer, the generic paper assignment–which I am just as guilty as anyone else of including in my syllabi–can come across as pointless, a waste of time, or simply too stressful. And thus, students are tempted. How many cross the line and use one of these essay mills? The story from the BBC cited above argues that the number is very small. But a recent poll of my students–I asked them how many knew someone who had used such a service and how many knew someone who had considered using such a service–indicates that the BBC may be underestimating. About 10 percent of my students said they knew of someone who had used such a service–but primarily in high school–and closer to 20 percent said they knew someone who had considered it. These results are not scientifically generated, but they are worrying. What then should faculty members do when one of the important learning outcomes in our programs is that our students will emerge as better writers than they were when they arrived on campus? I would suggest that we have to re-think “writing” altogether. Once upon a time, a five-page or ten-page or two-page essay was something we understood and believed had pedagogical value. Whether such essays were/are the best way to teach writing is another matter entirely, but is the case that thousands, if not tens of thousands, of faculty assign such essays every semester. Given that essay mills are going to become more ubiquitous rather than less and the five or ten-page essay fits their business model like a glove, I propose that we need to throw in the towel and teach differently. What would that look like? One model is what I have been doing in my research methods course. Rather than asking students to write a ten-page research essay, I have them write the first two pages of a 25 page essay over and over and over until they get it right. This kind of writing is iterative, hard, and frustrating for students, but by the end of the exercise, they have a great start for a long paper and so know how to begin such a work. A testing intensive version of the class in which their grade is based entirely on exams. This way, students who simply want an introduction to the subject (more than half of my students most semesters) can punt on the writing and just take some tests. Students who want to use the class both as an introduction to the subject and an opportunity to improve their writing can choose Option 1, but know in advance that they are in for some serious engagement around their writing skills. Students in my digital humanities classes are making things, not writing essays, so I have no worries in those classes. Will this approach be fool proof? Of course not. Will it help to reduce the potential use of essay mills? Maybe. Will I be happier because I won’t need to suspect them of buying papers? Definitely. This entry was posted in Posts and tagged cheating, writing on April 8, 2019 by Mills. North America is lousy with ghost trails. Most of us walk right past them without noticing, or if we do, don’t stop to think about what we just saw, why it’s there, who (or what) made it, how it might take us into a historical moment if we would just step off the main path, push aside the overhanging branches, or step through the cat briars, and push off into the woods, following the ghost trail wherever it leads us. Maybe it’s a primordial fear of the unknown, or the Hollywood created notion that if you walk into those woods you might encounter a crazy person with an axe. Whatever the reason, too often we walk right past ghost trails and leave it to others to wonder what might be up there in the woods, around those rocks, or over that ridge line. These days I’m spending a lot of time thinking about ghost trails, because I’ve begun work on a history of Virginia’s “Lost Appalachian Trail” — the 300 mile-long section of the Appalachian Trail that used to run from just southwest of Salem, Virginia, down through Floyd, Patrick, Carroll, Grayson, Smyth, and Washington counties. 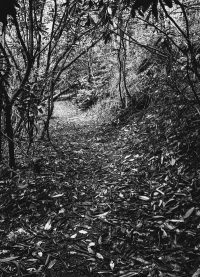 That section of the Trail, first laid out in the early 1930s, was the official route of the AT for more than 20 years, until it was abandoned by the Appalachian Trail Conference (ATC) in the early 1950s. The decision to abandon the route through Southern Virginia was pitched by the ATC as a protective measure, designed to get as much of the Trail’s route onto federal land in the new Jefferson National Forest as possible. You don’t have to be much of a historian to know that simple explanations like that are rarely the whole story. It is true that the ATC sought to protect as much of the Trail as possible by moving it into National Parks and National Forests. But it is also true that the relationship between the leadership of the ATC — effectively Myron Avery — and the local trail community in Southern Virginia was never a strong or comfortable one. The weak nature of that relationship meant that it was much easier to abandon the 300 miles of trail from Salem to Galax to Damascus than it would have been to route the AT away from a section managed by a trail club with a strong leadership closely tied to the ATC in Washington. And so, I’m chasing a 300 mile long ghost across Bent Mountain, past Meadows of Dan, through Fancy Gap, over Fisher’s Peak, down Main Street in Galax, across the New River at Fries, over Comer’s Rock, through Skulls Gap, and down the Iron Mountains to Damascus. I’ve already interviewed a 101 year-old woman who remembers going into the mountains with her father to help build the AT in 1930. I’ve pushed through the cat briars to follow a ghost trail that might be part of the old AT route near Adney Gap. I’ve had lunch in the Floyd General Store and gotten lost near Elk Creek. I’ve chatted with an antique dealer about the “courthouse murders” in Hillsville, and I’ve driven through some of the thickest fog I’ve ever seen along the crest of a mountain, hoping that the lack of guard rails won’t be a problem. As Bill Turkel wrote in The Archive of Place back in 2008, I’m after “latent or seemingly insignificant traces” of the past, traces that, I hope, will help me find my way to some interesting conclusions about a place and a past that is all but opaque to the community of hikers, advocates, supporters, and others who care about the Appalachian Trail. At the very least, I’ll end up with some good ghost stories. This entry was posted in Posts on January 31, 2019 by Mills. Yesterday I was honored to take part in a digital history seminar that gave its participants an opportunity to reflect on the life and accomplishments of our friend and colleague Peter Haber who died more than five years ago. Peter and I (along with Jan Hodel) were collaborators on an experimental digital history project and through that (and other) work, became friends as well as colleagues. I’ve already written an obituary for Peter, so I won’t rehash what I wrote in 2013, but you can read it here. For a historian, Peter was always looking forward, so instead of revisiting his life, I’ll summarize instead what I said in the seminar. That the speakers were located in Basel (with the audience), Innsbruck, and here in Fairfax would, I think, have made Peter very happy. My task was to say something about what has happened in digital history over the past five years and to peek a bit into the future, so here’s what I said, more or less. To begin with, I think it’s important to recognize what hasn’t changed in the past five years. The short answer is, a lot hasn’t changed, but the two big issues that we still haven’t dealt with successfully are deciding how to credit the work of digital historians in academia. Promotion committees still struggle with digital history, largely because they want to find ways to make the work we do fit into categories they already understand, like “book” or “article.” Digital history doesn’t work that way and will never fit into those categories. As long as we keep trying to fit the square peg in the round hole, we’ll be stuck where we are. The second thing that hasn’t changed is that granting agencies (generally) don’t like to fund the sustainability of digital projects. Funding new projects is great and I’m very thankful to all the funding agencies who have supported my and my colleagues’ work over the past two decades. But it remains very difficult to find funds to keep those projects updated and online. 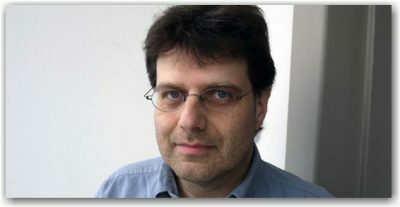 On the good side of the ledger, I would argue that the two most positive developments of the past five years are the mushrooming amount of linked open data available to digital humanists, and the increasingly blurry boundaries between the history, library science, geography, linguistics, computer science, and other disciplines. The more linked open data we have, and the better our tools get for working with that data, the more interesting will be the results coming from the analysis of these vast corpora of texts, images, numbers, sounds, and other forms of humanistic content. Both of the other speakers in the seminar mentioned AI and machine learning as critical to what’s happening, but call me a cautious optimist on that front. Thus far, the results I’ve seen from machine analysis of these data sets hasn’t really resulted in any big insights that have made historians sit up and say, “Wow!”. I expect that to happen one of these days, maybe soon. But right now I think the most interesting results coming from the analysis of linked open data is coming from the minds of humans rather than from machines. I am also gratified by the blurring of those disciplinary lines I just mentioned. Geospatial humanities projects are excellent examples of that blurring, but I’m also encouraged by the growing sophistication of conversations between historians and librarians and archivists around information architecture. Digital historians and digital archaeologists are also starting to find interesting common ground. Our students will live lives that slide back and forth across and through disciplinary boundaries, so why shouldn’t we? Not long ago I had an incredibly energizing conversation with Cristina Wood about her work in data sonification. I think Peter would be very happy to see the increasing levels of collaboration across these boundaries and the entrepreneurial work graduate students like Cristina are doing. My peek into the future included a prediction: future historians will spend an inordinate amount of time trying to preserve cultural resources around the world that are vanishing as a result of climate change — especially those that will submerge into the oceans and seas as a result of the melting of the Greenland and Antarctic ice sheets. Digital historians are going to be called upon to help preserve these historic sites and other resources, so the time is already here when we should be preparing our students for this work. 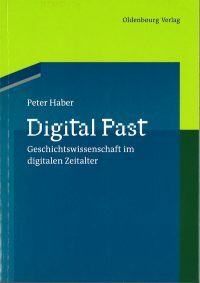 I like to think Peter Haber would have, in his gentle yet firm way, pushed back against the notion that there were right and wrong ways to do digital humanities. Fortunately, as yesterday’s seminar demonstrates, his legacy lives on through his colleagues, his students, and his family. This entry was posted in Posts on January 25, 2019 by Mills. 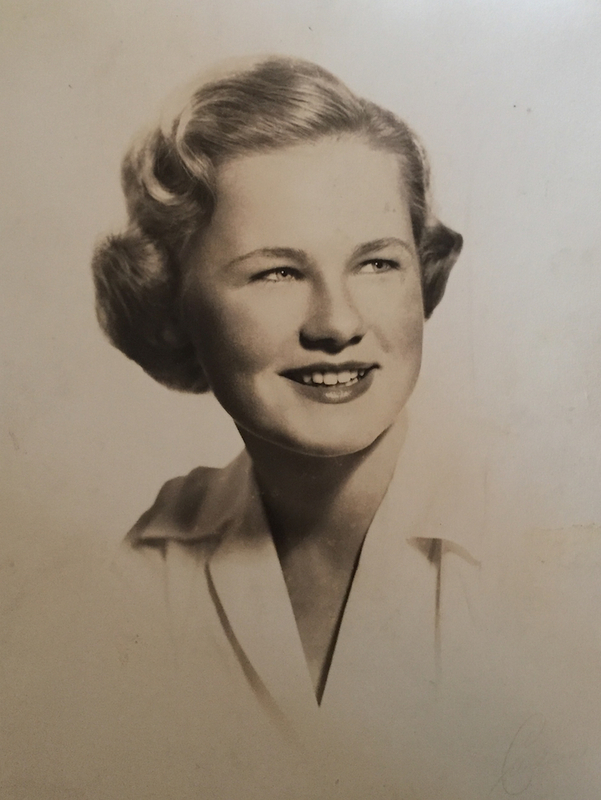 Last week I had the unenviable task of culling the life of my mother-in-law, aged 81. In some ways I was the perfect person for this task, because in my sister-in-law’s garage there were 32 banker’s boxes of files that needed to be sorted through in just under 72 hours, because we were relocating her from Colorado to Virginia on short notice. Who better than a historian to do the work of pulling the significant items out and saving them? Because she was the keeper of the family history, several of those boxes were filled with scrapbooks, photographs dating back to at least 1870, documents from a relative’s Civil War service in the Army of Northern Virginia, hundreds of more recent snapshots, an edited set of letters sent home from the American campaign in North Africa, Sicily, and Italy in 1943-44, a series of photographs from my mother-in-laws years as a student at Sweet Briar College in the mid-1950s, and love letters exchanged with her second husband (to whom she was married for more than 30 years). Plenty of the documents were easy to identity, but almost all of those easily identified were texts. The photos, not so much. Some had scrawled notes on the back, but most did not. I would ask my mother-in-law, but she has dementia and has a difficult enough time remembering me, much less who is who in a photograph that is more than 100 years old. My wife was at least a little help. 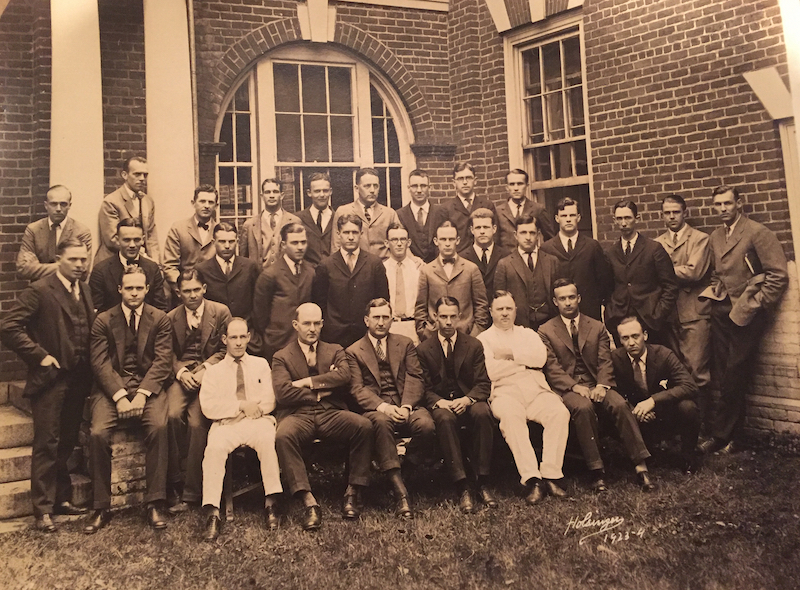 She could identify her grandfather in this photograph from his undergraduate years at the University of Virginia. I happen to know a little bit about his life, but almost all of it in the last two decades before he died. I do know he attended UVa and went on to the Harvard Medical School. After that he returned to his native Lynchburg, Virginia, where he practiced medicine until he retired. And I can pick him out in this photograph, because he looks so much like my brother-in-law. But beyond identifying him and knowing that this was an undergraduate fraternity of some sort, I don’t have a clue about anything else in the image. And so I’m left to cull her life down to one banker’s box of texts and images, most of them identified, but many not. The rest, well, they’ve entered the dustbin of history. In the end I’m left wondering if it is easier or more difficult to cull the record of someone’s life when you are a historian. Today, anyway, it feels a lot more difficult. This entry was posted in Posts and tagged family history on February 15, 2017 by Mills.